Gettle offers power delivery services including aerial and underground transmission and distribution solutions for companies of all sizes across the industrial and manufacturing industries as well as government, utility and municipal partners. Gettle offers 24-hour service and support, including emergency storm response. 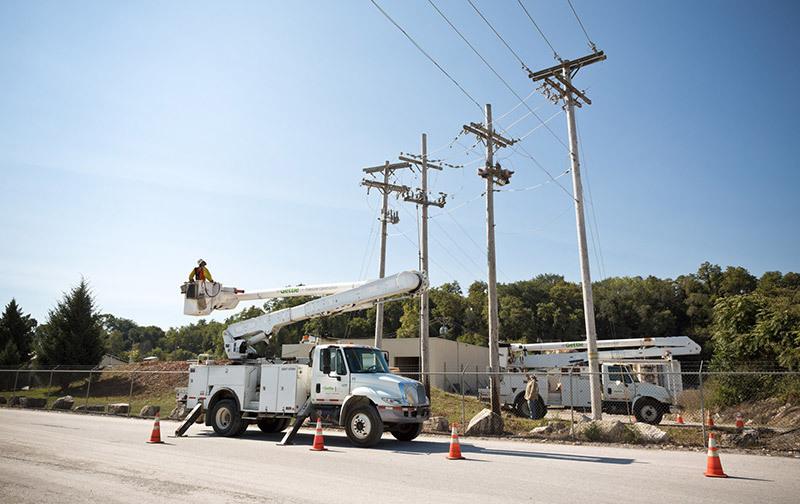 Our team of engineers, linemen and technicians operate a specialized fleet of pole/line equipment including auger trucks, bucket trucks, tension pulling machines, trenchers and backhoes. All Gettle trucks are die-electrically tested and capable of working on energized lines up to 15KV. Gettle is committed to ensuring a safe working environment for our team and clients. All Gettle team members participate in comprehensive company-wide educational safety programs, are outfitted with the highest quality safety gear and tools and have experience working with a variety of on-site customer-specific training and safety programs. From re-conductoring existing lines and emergency storm response to new line installations and alternative energy projects, Gettle’s comprehensive approach to pole/line construction offers the convenience and efficiencies of a single source of contact able to manage all of your power delivery needs from planning and engineering to installation and maintenance. Contact Gettle today to learn more.